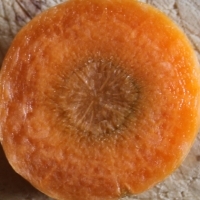 A sliced carrot looks a bit like the human eye. Carrots are rich in Beta carotene which is a powerful antioxidant (which helps to prevent attacks by free radicals which cause cancer). The carotenoids in carrots help blood sugar regulation – which means that our energy levels don’t see as many dips or for diabetics, a carrot rich diet can alter the amount of insulin required. Carrots have a high fibre content which helps to reduce the bad cholesterol while increasing the good cholesterol which helps to reduce blood clots and heart diseases. The best way to eat a carrot? Raw! Take a carrot (freshly peeled) as a mid morning snack and see your energy levels rise. Equally, steam carrots retain more of their nutrients rather than boil them. Of course, in season carrots taken straight from the garden or sourced locally are likely to be richest in nutrients. In the UK carrots are in season from May to October. Lastly, carrots are a natural sweetner which is why many Italian tomato sauce or pasta recipies contain lots of carrots.